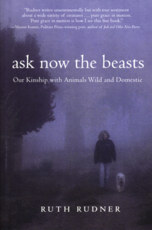 Ask Now the Beasts is a beautiful meditation on how we relate to animals: sometimes loving, sometimes misguided, often exploitive, often with genuine concern. Capturing the powerful ways that animals interact with us spiritually, activate our imaginations, and tie us to our own ancient beginnings, Ruth Rudner finds meaning and appreciation for the way in which each animal exists fully in its own world -- and how that world relates to ours. Entering variously into love, hope, possibility, heartache, and wonder, Rudner's stories ponder the richness of relationship, whatever form it takes.